Sutradhar means "thread holder." Art museums worldwide display woodworks of these gifted people. They are of a low Hindu carpenter caste. High caste Brahmins will not even take water from them, because they believe it will pollute them. 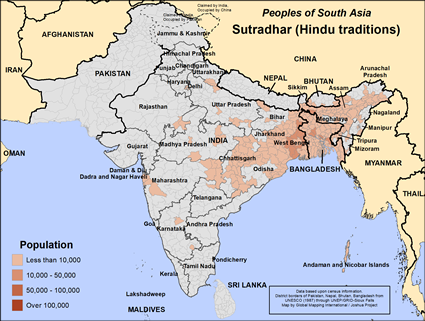 The Hindu Sutradjar people live in India, Bangladesh, and Nepal. Sutradhar people are highly skilled as woodwork craftsmen. They carve door designs, windows, boats, temple walls, and agricultural tools. The furniture industry has brought changes to how Sutradhar people live and work. Many now work under entrepreneurs in urban cities. Others who are novices do not do as well and can barely survive. Bangladeshi people harass Sutradhar people and take their land without authority. This causes continual tension on many fronts. Vishwakarma is their patron deity and Lakshmi their family deity. Kali, Shani, etc. are village deities. 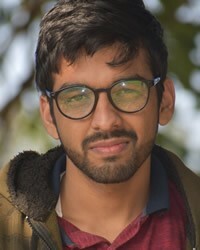 Dakshineswar, Tarakeshwar, Puri, etc. are pilgrimage centers. A Brahmin priest serves to perform birth, marriage and death rites, as well as leading them in worship of Hindu gods. Although written, audio, and visual Bible resources exist in the Bangladeshi language, there are no known believes among the Sutradhar people. Their greatest need is to know Almighty God who gave His life to pay the full penalty for all of their sins. * Pray for a "Book of Acts" type of movement to Christ among the Sutradhar people. * Pray for Holy Spirit anointed believers from the Sutradhar people to change their society from within. * Pray for his kingdom to come and his will to be done among the Sutradhar people. http://www.peoplegroups.org/explore/groupdetails.aspx?peid=49040View Sutradhar (Hindu traditions) in all countries.